KDCREIT’s 3Q/9M DPU of 1.85 Scts/5.47 Scts was broadly in line with expectations. A healthy balance sheet with foreign sourced income hedged until 1H20. Maintain ADD with a slightly higher Target Price of S$1.51. KDCREIT’s 3Q18 DPU of 1.85 Scts (+6.3% y-o-y) was in line with our expectations, forming 24% of our FY18 forecast. The y-o-y improvement was contributed by the acquisitions of SGP 5, maincubes and Dublin 2 data centres as well as higher variable income from other Singapore properties, but partly offset by higher finance costs and management fees as well as capex reserves set aside for SGP 3 and SGP 5. For 9M18, KDCREIT registered DPU of 5.47 Scts (9M was 70% of FY18 forecast) which was 4.8% higher y-o-y after adjusting for one-off capital distribution in the previous corresponding period. KDCREIT’s Portfolio occupancy rose 1.1% pt q-o-q to 93.1% at end-3Q18 with higher take-up at SGP 5 and Dublin 1. There is a minimal lease expiry of 0.1% for the remainder of FY18 and a further 2.7%/4.6% in FY19/20. Beyond this, the trust had recently entered into an agreement with Macquarie Telecom (MT) to construct Intellicentre 3 East DC (IC3) on vacant land within the IC 2 site in Sydney, Australia. Completion is scheduled for 2019- 2020 and a new 20-year triple master lease with MT for both IC2 and IC3 should commence post completion. Hence, we anticipate that KDCREIT’s earnings will grow steadily. KDCREIT’s gearing stands at a healthy 32% as at end-3Q18 with 86% of its debt on fixed rates and average debt cost of 1.9%. This puts the trust in a good position to explore new acquisition opportunities in Asia and Europe as well as in the US. 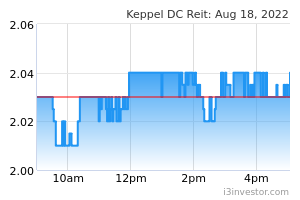 KDCREIT has also hedged its foreign sourced distributions until 1H20, providing the REIT with good income visibility. We adjust our FY19-20 DPU estimates post results and to factor in contributions from the new IC3 DC project in Australia. Accordingly, our DDM-based Target Price is raised slightly to S$1.51. We continue to like KDC REIT for its exposure to the positive fundamentals of data centres as well as potential inorganic growth. Re-rating catalysts include accretive while downside risks could come from unexpected rate hikes.